A beautiful 4 piece Waterbury Coaster set on a Piano Finish Rosewood Base. 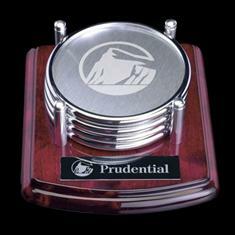 Available in either Chrome or Gold finishes to highlight your logo. The Brushed Aluminum finish will add a touch of elegance to any home or office. Comes in a gift box. Brass Plate is not included.